They hold 104 spools of thread! They’re translucent, so I can easily see what colors are inside. They’re skinny, so they fit in odd little spaces between my storage bins. They have handles, so they’re easy to pull from the shelves and easy to carry. They’re compact – no wasted space. The hinges come apart, making two trays of thread to place next to my machine – awesome! They release the spools easily – just pull the end of the spool up and slide it off the pin. Did I mention they hold 104 spools of thread? I just found out they come sized for larger spools, too! Ok so how do you suggest storing the big spools of thread? I have a ton of Sulky and Isacord embroidery thread and it never fits properly into containers like this. 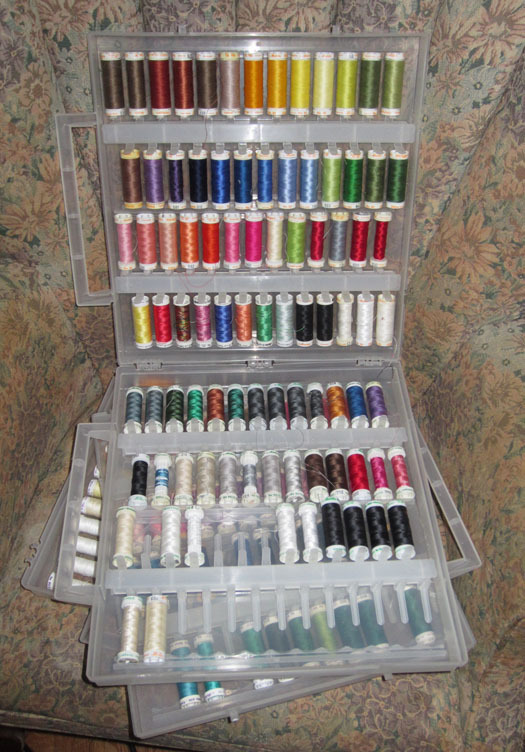 I keep my thread in drawers by type of thread: cotton or poly or silk, and by weight and ply. I like to have lots of bobbins, so I keep each bobbin with the spool by using Handi-Bobs to attach them together. Also use those pink plastic things around the bobbin thread to keep it from unraveling. Big DISLIKE for thread brands with a spool hole that is too big or small for my Handi-Bobs!